Denmark's shores have been invaded by an unwelcome army of non-native oysters, but it looks like China may help eat its way to the rescue. Around 500 tonnes of the molluscs are clogging parts of the Scandinavian coast, threatening native species. In jest, Denmark's embassy in China turned to social media, inviting Chinese tourists to eat the shellfish. Following a ravenous response from netizens, companies like internet giant Alibaba offered to help out. This all started with the embassy's post in late April (in Chinese) on Twitter-like site Weibo about the oyster problem. It explained how the Pacific oyster species was introduced from Asia about a decade ago but numbers have increased so rapidly they now surpass their local counterparts. The post has received more than 15,000 responses to date, including offers to "eat them to extinction". Some have even asked for free trips or an "eaters visa" to Denmark. The embassy has continued to play along, declining free trips but saying they would forward the "creative ideas to relevant officials". As the post became a national talking point, Alibaba - the dominant online marketplace in China - got in touch with Danish officials, later announcing they had "agreed on further collaboration". Its online shopping unit Tmall said it was in talks with customs authorities in Hangzhou over ways to expedite the process of bringing the oysters - and other agricultural products - into China. The embassy even held a live internet demonstration on Tmall showing different ways to eat an oyster. Instead of downing it raw with a drizzle of lemon or tabasco sauce, which is popular in the West, many Chinese foodies prefer them crushed then grilled with mashed garlic and chilli sauce. Danish embassy officials told the BBC they had also received "serious requests" from other e-commerce firms wanting to take on the unwanted seafood. But they stressed it was "important that the relevant food authorities in both countries agree on the import/export situation and then practical things can start from there". It isn't just e-commerce firms whose appetites have been whetted. Chinese travel agencies are also pitching a "special gourmet tour" to Denmark. "Let's help the Danes eliminate these oysters invaders!" wrote one Beijing tour operator, which is also offering a certificate after completing the trip. Danish fisherman and tourism industries are already feeling "optimistic" about the impact of the viral news, according to embassy officials. "Since these Pacific oysters took Chinese headlines for more than one week, many local seafood traders in Denmark have received business requests, as many as 10 on a daily basis. 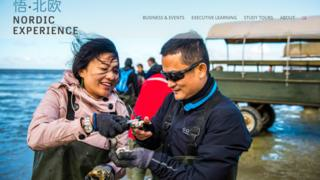 "Danish travel agencies that offer tailored oyster tours to the Western coast of Denmark have also got back with an increase in their business, mostly from Chinese tourists." It helps that 2017 had already been designated an official China-Denmark tourism year, with a roster of programmes in place. Alibaba and Denmark also signed a memorandum of understanding in March to increase Danish exports and promote the Nordic country as a tourist destination. Denmark's Prime Minister Lars Lokke Rasmussen also happened to be in China on an official visit this week. He met his Chinese counterpart Li Keqiang in Beijing on Wednesday and signed a range of trade deals, including one to export Danish pork and organic produce to China. They also agreed on the loan of two Chinese pandas to a zoo in Copenhagen. There was no word on whether the molluscs crisis was mentioned though. There is also the question of whether the online appetite will materialise on the ground, given China produces about 80% of the world's farmed oysters. Additional reporting by Tessa Wong.